Last night Aaron and I attended the New York premier of American Fiesta, a one-man show at the Vineyard Theatre, whose recent big hit was the pre-Broadway Avenue Q. 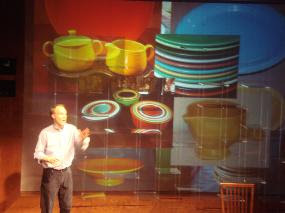 Written by and starring Steven Tomlinson (an Austin native, where the show originated), American Fiesta is an exploration of gay marriage, family, and the neuroscience of politics, told through the metaphor of the narrator's obsession with collecting Fiestaware, the multi-hued Depression-era dinner sets that were sold piece by piece to money-pinched housewives. Tomlinson, a Stanford-educated college professor, corporate speaker, and lay Episcopal preacher, doesn't act so much as he lectures, using a series of back-lit slides to contemplate his Church of Christ-going parents' reaction to his plan to marry his partner in Vancouver, the 2004 election, and the way the brain functions to excite or pleasure. He unfolds his theories via the show-long metaphor of his eBay-fueled mania to collect the complete, perfect, non-flawed set of Fiestaware, the holy grail of those so obsessed. Tomlinson voices many characters in his performance, his husband, his parents, an antiques dealer, using hand gestures and subtle but effective changes in his Texas twang. The show has lots of laughs, but most of them are laughs of recognition, of nodding and saying "yes, it IS like that", rather than punchline-driven gags. And listening to Tomlinson recount the insane market for Fiesta collectibles, where a bowl can go for $500, as he continuously moves the bowls from shelf to shelf is a bit nerve-wracking, as I'm sure others in the audience must have worried that he would drop one. I know I did. American Fiesta is a rather quietly contemplative show and while I found Tomlinson often reminded me of motivational speaker Tony Robbins or televangelist Joel Osteen, I enjoyed him immensely. In the audience last night we spotted Nathan Lane, Terrence McNally, and other theatre notables, so the buzz must be strong already. Interestingly, the main producer of American Fiesta is former U.S. senator and NBA star Bill Bradley. The Vineyard Theatre is a small house, with excellent sight-lines, and is located right off Union Square. Tickets are available here. Highly recommended.